No matter how many recipes I have, once and a while I get bored by my repertoire and I need to make something totally different to get me recharged. I love Indian Cuisine, but had never attempted to make it…until a few days ago. This is truly a “feel good” dish from the moment you begin preparing it. The fragrances at each phase of the cooking process take you on a journey. And once you sit down to feast on this dish, you will want to take the journey over and over. This, in my opinion, is a great dinner party meal because it will encourage conversation. In addition, it gets better with a day in the refrigerator to meld the flavors. 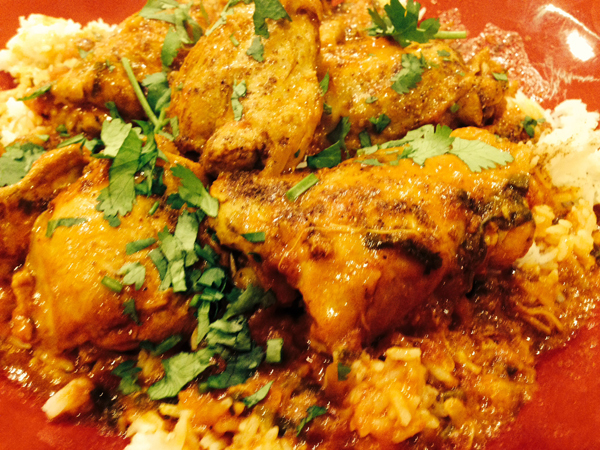 I served the chicken over steamed Jasmine rice alongside a platter of warm Naan to soak up the wonderful sauce. PS: Garam Masala is available in the spice aisle of most grocery stores. 1 28-ounce can whole peeled tomatoes, lightly pureed in the blender so they are still a bit chunky. Add the onions and stir. Reduce the heat to medium and cook the onions for approximately 15 minutes (stirring every 2-3 minutes), until they get a deep, rich golden brown. This is a very important step, so pay attention and do not burn the onions. You want them to caramelize and give off their sweet flavor. Add the ginger, garlic and Serrano pepper to the onion and cook for 2-3 minutes, stirring frequently. Add the chicken in batches (6 pieces at a time) and brown on both sides (removing the first batch to a plate before adding more chicken). When the second batch of chicken has been browned add the first batch back in to the pot with any accumulated juices (be sure to pour everything that has accumulated on the plate back into the pot. The first batch of chicken will have picked up pieces of ginger, garlic and pepper and you want to add those flavors back into the pot). Add the coriander, cumin, turmeric, cinnamon, cayenne and salt. Stir the chicken again to make sure the spices have distributed throughout the pot. Add the tomatoes and give another good stir, being sure to scrape up all the brown bits that accumulated at the bottom of the pan. Add the cornstarch to the yogurt and stir to completely incorporate. Pour the yogurt into the pan and stir vigorously. The yogurt will act as a thickening agent for the sauce. Bring the chicken to a boil and then turn down to a simmer. Put the lid on the pot and cook for 30 minutes. Taste for seasoning and at this point, add salt or more cayenne to your liking. The Elegant Occasion Note: You can make this recipe to this point, and store in the refrigerator for 24 hours. Place the jasmine rice (I follow the directions on the package for 4 cups of cooked rice) on a large serving platter and then place the chicken pieces on top of the rice. Ladle some sauce over the entire platter and then sprinkle the Garam Masala all over the chicken and top with additional fresh cilantro. Place an additional bowl of sauce alongside the platter.